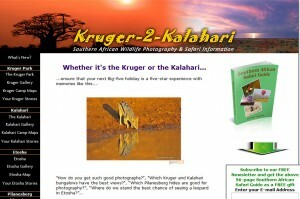 This weeks photo website is Kruger-2-Kalahari. A great resource for those with a love of Africa and wildlife this site is filled with tips, reviews and interviews with photographers including big names like Moose Peterson. If your passion is wildlife photography then make this site a regular stop in your week.